Haydn: Playful or Sportive? That's the question. Emperor: But what do you think of Haydn's chamber music? Dittersdorf: Why, it is making a world-wide sensation, and most justly too. Emperor: Is he not often too playful? Dittersdorf: He has the gift of sportiveness. But he never loses the dignity of art. Emperor: You are right there. Haydn: playfulness or sportiveness? That's the question. In reality, the English translation here tries to render a subtle shift of meaning that Dittersdorf obtains by working around the same German term: tändeln. And so the English translator tries to render this subtle shift of meaning by using two different English terms (playful and sportive) for the same German word (tändeln) used in two a bit different contexts. This question, in reality, is fundamental and, if Mozart Era scholars had read von Dittersdorf's book with more attention, they would have avoided a whole series of rather erroneous positions on Haydn and on his music. And that's why Dittersdorf (who was constantly attacked by the same Greybig) changes the term playfulness by wisely adding that Haydn never never ruins the quality of his art (ohne die Kunst herabzuwürdigen), rebuilding thus a clear connection with the noble territory of an intelligent wit! 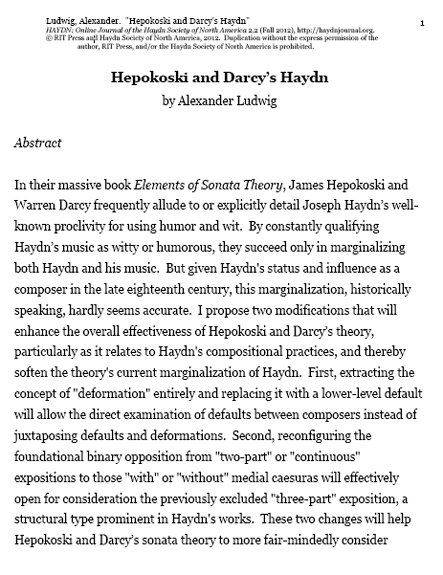 (2) since the so called three-part exposition is structurally prominent in Haydn, and the descriptive formulas used by Hepokoski and Darcy fail to correctly analyse it, it is better to treat the Sonatas expositions as those with or without medial caesuras, by avoiding so to use the too imprecise binary opposition two-part and continuous expositions. To download the complete article in .pdf format, remember to log in into Academia.edu first. In Academia.edu it is always better to download the articles, because the online reader is a Low-Definition Reader. So to read the articles in good HD format, always download the .pdf files and read them offline.